India and Pakistan, the bitter arch rivals will take on each other to start their campaigns in the ICC Champions Trophy 2017. For once the roles have reversed for the Asian giants, what with Pakistan having a settled coach in Mickey Arthur while India grappling with how tough a disciplinarian Anil Kumble is being, with the Indian superstars. As India continue to refuse to play Pakistan outside of ICC tournaments, this clash comes as a relief for cricket fans from both sides of the border. Edgbaston, which will host the crucial tie has had iffy weather conditions lately; with the Australia - New Zealand match having already suffered a washed out yesterday. But the pitch is a very good one for batting with scores in excess of 300 a regularity at this ground in the recent matches. Both India and Pakistan have a strong batting line up but the difference is that this time, India have a bowling attack that matches that of Pakistan. With Umesh, Bhuvi and Shami during on all cylinders and Ashwin and Jadeja manning the spin department Indian bowling looks to be in a pink of health. Their batting however is a concern this time with Rohit, Kohli, Dhawan and Yuvraj all having a mediocre IPL which ended just a few weeks ago. Dinesh Karthik looked good in the warm up match and he might play over Yuvraj. Kedar Jadhav and Hardik Pandya will provide the finishing along with the evergreen Dhoni. Pakistan batting will depend on Hafeez and Shoaib Malik both of whom love playing against India. They also have the talented Babar Azam and explosive Ahmed Shehzad in their ranks. Sarfaraz provides late hitting along with a couple of new players who stole the limelight in the warm up match against Bangladesh. Amir, Junaid, Wahab and rookie Shadab Khan lend a menacing look to the Pakistani bowling attack and they will be keen to unsettle a tentative looking Indian batting line up. India vs Pakistan is a contest which is a money milking cow for the ICC and Star Sports has been promoting this match as #SabseBadaMoh. 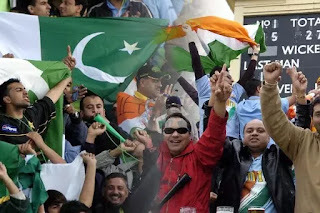 I just hope that the English weather holds up and we are treated to a spectacle by both India and Pakistan. One thing is for sure though, the ground will be packed, there will be noise, there will be passion in the air and a silent prayer on the lips of the millions who will witness this encounter! Mumbai Indians have one of the most rounded squads for IPL 2017 and while other teams having been sweating over the injuries of key players, Mumbai welcome their leading batsman and captain Rohit Sharma; who is returning after a long lay-off. MI will be hoping to 'Hilao the Duniya' & pick up their third IPL title as they have also roped in the astute Mahela Jayawardena in their backroom staff! Key Players - Mumbai captain and their batting mainstay Rohit 'Hitman' Sharma is scheduled to return from injury that laid him low late last year. They also have Parthiv Patel who is coming off a stellar year in domestic cricket. Buttler, Rayudu, Pollard and Pandya brothers shore up their middle order. They have enough arsenal in their bowling tank with Lasith Malinga, Mitchell Johnson and Jasprit Bumrah all set to rev up and scare the opposition batsmen away. Old timer Harbhajan leads the spin department along with Krunal Pandya. Injury Tracker - Mitchell McClenaghan and Tim Southee were recently injured and it is not clear if they are available right from the start. He is one of the leading batsman in IPL cricket and has been a key figure for the Mumbai team over the years. He is not a big name but has already established himself as a vital cog in the Lankan set-up. Capable of big hitting late in the innings, he also bowls clever slower balls to befuddle the batsmen. MI did a great job by aquiring him at this years auction. My Prediction - Mumbai, as always, have a nice and settled line up with an array of players who can come in and fill up a position left vacant in case of any emergency or injury. Traditionally MI have been slow starters but once they get going it is almost impossible to stop them. I expect a top 3 finish from them in this, the 10th edition of the VIVO IPL. Royal Challengers Bangalore, traditionally, have one of the most glittering line ups in IPL but for all their riches, they are yet to lay hands on the silverware in the previous 9 seasons. RCB fans would want to believe that IPL 2017, the 10th season of the Indian Premier League is where they get lucky finally! Key Players - Bangalore side is studded with big names like Virat Kohli, Shane Watson, AB '360 degress' De Villiers, Chris 'Universe Boss' Gayle and it is their batting line up that makes them a force to reckon with. With the names mentioned above, the opposition bowlers are under pressure even before they step onto the field. T20 specialist Tymal Mills has been added to strengthen their bowling while they already have Yuzvendra Chahal in their ranks who has been very successful for them. Injury Tracker - Even before IPL 10 has commenced, RCB have been dealt severe blows with opener KL Rahul ruled out of the entire tournament while participation of Virat Kohli is also uncertain. Mitch Starc, who was hugely successful last year will also be missing from RCB colours this season. Fantasy Cricket Pick - Pick anyone from their top 3 and you will get bucketful of points. I would pick Shane Watson as the pick as he is likely to open in the absence of Rahul and will also bowl giving you points. He has had very strong seasons with the RCB team and finally got picked in the Indian side for T20I's where he showed great composure against an attacking English line up. He will once again be their leading spinner and is bound to get wickets on Indian pitches. My Prediction - RCB might finally break the hoodoo of not winning the title as they have smartly invested in good bowlers this time. Mills, Milne, Shamsi are now associated with them and with an ultra strong batting line up already in place; their bowling reinforcements might just have completed the final piece in the missing jig-saw puzzle for them. I think they will certainly go deep and have all the ingredients to pick up the trophy for the first time. Kolkata Knight Riders are one of the most consistent sides in the IPL with a huge fan following and the support of their fans goes a long way in scripting the fortunes of the side owned by the superstar SRK! They will be looking to add to their cupboard the IPL Trophy for a record 3rd time this year. Key Players - Gautam Gambhir has been an inspirational captain for KKR and he along with Robin Uthappa have been instrumental in providing them with good starts. Although they will miss 'Dre Russ' big time but they have Shakib, Narine and the Indian spin sensation Kuldeep Yadav in their ranks for IPL 2017. Manish Pandey and Yusuf Pathan will shore up their middle order as they have been doing for more than a couple of seasons now. Injury Tracker - They will miss the services of their herculean all rounder Andre Russell as he is currently suspended by the ICC for violating anti-doping norms. Umesh Yadav might miss out on the initial stages of the IPL after being part of a long Indian season. UPDATE: KKR have signed Kiwi explosive batsman and a handy seam bowler Colin De Grandhomme as a like for like replacement for Andre Russel. He can be a great pick in your fantasy team as he bats up the order and is also likely to bowl his quota of 4 overs in nearly every match. He is also in relatively good form coming off a successful series in Sri Lanka. Lynn has shown in the BBL that he is a monster striker of the ball and if he gets enough opportunity, he can destroy bowling attacks on his own. With Russel missing from KKR's scheme of things this year Lynn might just get an extended runs in IPL 10. My Prediction - Kolkata Knight Riders have a decent squad but Gambhir and Uthappa are going through a rut and with talisman Russell missing too, I find it hard to see them getting past the league stage this year. They might finish 5th or 6th in my opinion. Kings XI Punjab have had a wretched time in IPL finishing last in each of the last two editions of the league. Their big ticket players in Maxwell, Vijay, Miller and others have failed to perform consistently which has meant that the team has always been under pressure. Key Players - Punjab decided to hand over the captains arm band to 'The Big Show' Maxwell for IPL 2017 and a lot will indeed depend on how Maxi goes right through the tournament. With Murli Vijay & Martin Guptill set to miss the initial games due to injury, Maxwell along with Miller and Morgan become the fulcrum around which the Punjab team will revolve. Wriddhiman Saha and Axar Patel will be the key Indian players in their set up along with Manan Vohra who can give blistering starts at the top of the order. Injury Tracker - Murli Vijay and Martin Guptill will both miss initial games due to injury. It is not yet clear when they will be available. Stoinis is coming off a pretty successful Big Bash League season and played a stellar role for the Australia ODI team. He can fetch points in both the batting and bowling department and can be a great pick of he gets going. Mohit and Sandeep Sharma will once again shoulder the responsibility of opening the bowling for the Kings. They have thus far bowled superbly in pair both at the start and at the death. My Prediction - Punjab have a lot of players who can boom or bust in a second and that's the exact reason why this team fails so often. Their batting looks good on paper but they look thin in the spin department to me which might come to haunt them. I think they will, unfortunately, miss the playoffs once again. I have loved this game since the age of 8. Its not only a game for me now!! I write on my Game, Cricket. Vodafone Contest Winner!!! Thanks Indiblogger!!! All the articles are original works of DS. Do not use it without taking prior permission. Theme images by mammuth. Powered by Blogger.